YOUR AMAZING CHEER GYM OFFERS CERTIFIED, PROFESSIONAL INSTRUCTION FOR ALL SKILL LEVELS ~ FOR ALL AGES, GIRLS AND BOYS, IN ALL CURRICULUM IN A USAG CLUB MEMBER TRAINING FACILITY. FALL Schedule Days and Times ARE POSTED. the title of your desired class. Fees and Schedules are subject to change without notice. REGISTER NOW for FALL CURRICULUM and Your AMAZING Gym's National Champion Allstar and Dance Teams. We offer Pre School pick up...Call for Details! $ Fees for Allstar Teams by request. $25 per month each additional class for Allstar Full Competitive Team Members and Exhibition Team Members. $40 per month for unlimited Rock Climbing access during designated Rock climbing Wall hours or $10 per session. NOT AVAILABLE DUE TO THE FUTURE SALE OF OUR BUILDING. Click on Rock Climbing under classes for specific details. These fees are posted seasonally and vary from season to season. See Summer Curriculum and Camps in class description for past available curriculum and camps. Please read through all class descriptions for Your AMAZING Gym. See the seperate dance web site for all dance class descriptions and dance dept. details. Click on the dance icon on this site for a direct link. Click on each class title for times, dress code and more info. Please email or call with questions or further information. You can enroll by downloading The registration form by clicking on forms on the navigation bar or by calling Your AMAZING Gym at (123) 555-1234. 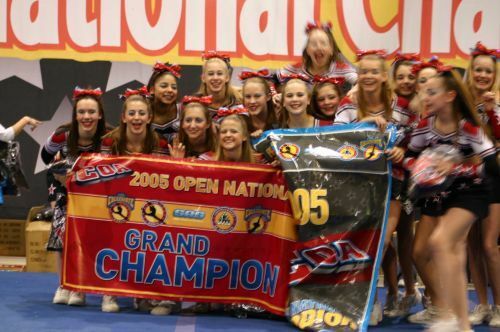 Your Amazing Gym is a Nationally Ranked, National Champion competitive allstar cheer program offered to 4-18 year olds and offers ALL SKILL LEVELS. Your Amazing Gym has a place for everyone from show and exhibition teams to all levels and ages of full competitive teams! Individual evaluation for squad placement can be made by appointment through the contact information on our contact page. No one interested in being a competitive cheerleader is denied the opportunity. Click on TEAMS on the navigation bar for a complete listing of available squads.Official Your Amazing Gym work out attire and full uniform are required. Additional tumbling is STRONGLY recommended for all of our Allstars. Click on above class title. Listed under notes are full details. TO BE CHAMPIONS IN CHEER AND IN LIFE! EXHIBITION TEAM(s) are minimal time and financial commitment squads for ages 3 and up focusing on the fundamentals of all star cheer and basic tumbling with 2 competitions as exhibition and 1 - 2 local area competitions as competitors, for a total of four competitions with occassional community performances and The annual Academy Showcase. Official workout attire and exhibition uniform required. Work outs - one day a week - 2 hour class. ACE SHOW TEAM(s) are minimal financial and time commitment squads for ages 3 and up, training in the basic fundamentals of all star cheerleading - stunting, cheer and dance, motions, jumps and basic tumbling. Community performance opportunities, The Academy's annual showcase and one local area competition as an exhibition team. No uniform required. Official ACE work out attire only. Work outs -One day a week - 1 - 1 1/2 hour class. The Academy's tumbling program is for ages 4 - 18 and is structured for the most progressive, technical training for beginner - advanced skill levels. Tumbling Classes are seperated by 1>skill level and 2>age. Beginner Tumbling is designed for those beginning athletes of all ages who are new the sport of tumbling. Teaching the basic gymnastic elements and building confidence with the required skills needed to advance to Tumbling I. Beginner Tumbling focuses on strength and flexibilty, foward and backward rolls, cartwheels and roundoffs, backbend flexibilty, handstands and the back handspring. TUMBLING I:Tumbling I is designed to teach the basic gymnastic technique needed to achieve such skills as a standing back handspring and a round-off backhandspring. It also encompasses basic jump and motion technique for the development of a well-rounded cheerleader. Students must master the following skills to move to Tumbling II: Proficient front and back rolls 10 second wall handstand Cartwheel/Round-off Standing back handspring Round-off back handspring Basic jump technique. Tumbling II is designed to continue the development of skills such as multiple back handsprings, and the basics of a back tuck. In this class the athlete will continue to advance their jump and motion skills. Students must master the following skills to move to Tumbling III: Toe touch back handspring Standing two back handsprings Round-off and 3 back handsprings Round-off back tuck Round-off back handspring back tuck Intermediate jump technique. Tumbling III is designed for the development of the more advanced athlete to achieve such skills as multiple backhandsprings to a back tuck and specialty skills - layouts, x-outs, tumble out etc.. They will also focus on the techniques of a standing back tuck. In order for an athlete to advance to Tumble IV, they must master the following skills: Round-off 3 back handsprings and a back tuck Standing back tuck (with a light spot) Round-off back handspring layout. Tumbling IV is designed for our advanced tumblers to focus on the mechanics of twisting with the goal being a full twisting back layout. Tumble IV will also focus on standing back technique and a toe-touch back progressing into double fulls and standing fulls. A pre-school developement class for ages 3 - 4 year olds, geared for our beginning Academy Kids. This class focuses on enhancing social and motor skills, flexibilty, and balance and coordination through basic tumbling and gymnastic training with a fun syllabus filled with various training games and apparatus. CHEER 101 - BEG. ~ ADV. This class is geared towards our non-competitive athletes. Students ages 3 - 18 who are ready to learn the basics or master more advanced cheer technique in a fun-filled environment then CHEER 101 is the class for these Academy Athletes. This class will focus on the fundamentals through the more advanced basic skills of cheerleading, utilizing drills, exercises and games to help your cheerleader improve in the areas of motion technique, jumps, cheer dance, stunt technique and basic tumbling. Cheer 101 classes are grouped by age. This class is offered to ages 12 and up who are preparing for their school's cheer tryouts...this is the perfect class to polish your skills and get the edge for possible placement on your school's squad! This class will focus on each participants individual needs and school's tryout requirements. From jumps and motion technique to tumbling entrance and exits to polishing your tryout material and stunting. Monthly sessions or class by class availablity. Flight School is offered to anyone wanting to learn or strengthen their skills as a flyer or group stunt teams wishing to work on stunt technique, dismount variations, and basket tosses. Individual flyers stunt with Your Amazing Cheer Gym's staff. High school athletes wishing to prep for collegiate stunting must apply for the class with a two week notice to allot time for the Academy to provide an adequate, qualified collegiate stunt partner for your individual needs. Staff will provide spotting and technical instruction for all flight school classes. Flight school is strongly recommended for flyers and is received at the ACE additional class discounted rate. Gymnastics is offered to both BOYS and GIRLS ages 3 - 18 yrs. in separate classes in a USAG formatted syllabus with progressive training on all apparatus. Open Gym / Make Up Classes are held the 1st and 3rd Saturday of every month. If an athlete misses a class, they may attend an Open Gym as a make up lesson for a fee of only $5. Verification must be made by absentees prior to attending an open gym. ANY athletes wishing to attend can do so for the Open Gym Fee of $10.00. Open Gym is offered for those athletes enrolled in any ACADEMY classes and ACADEMY GUEST. Open Gym structure is flexible and is a great opportunity for athletes to get extra practice. It allows the athlete to focus on a certain skill for as long as he/she feels necessary within the hour. ACADEMY staff will be present to assist on all skills!